Veterans Day is a federal holiday which honors those men and women who have served in the United States Armed Forces. It is observed each year on November 11. 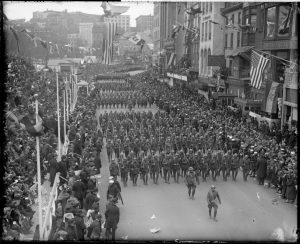 Veterans Day traces its history back to the end of World War I. Military hostilities ceased at the 11th hour of the 11th day of the 11th month in 1918, when an armistice signed by the Allied nations and Germany went into effect. When the war was over, many of the Allied countries declared November 11th a national holiday to commemorate the end of the "war to end all wars" and honor its veterans. This day became known as Armistice Day. The United States observed Armistice Day and, in 1938, made it a legal holiday. In 1954 Congress changed the name to Veterans Day, and made it a day to honor all U.S. military veterans. Changing of the Guard at the Tomb of the Unknown Soldier, 2005. Photograph: U.S. Army. The Veterans Day National Ceremony is held each year on November 11th at Arlington National Cemetery. 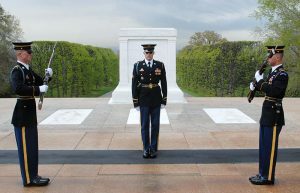 It commences at exactly 11 a.m. with a wreath-laying ceremony at the Tomb of the Unknown Soldier. It continues inside the Memorial Amphitheater, with speeches and a parade of colors by veterans' organizations. On Veterans Day, Americans have the opportunity to honor all U.S. military veterans, and thank them for their service to the country. *Photographs from the Boston Public Library's Leslie Jones Collection are available through the Digital Commonwealth, a statewide consortium of institutions from across Massachusetts that digitize and make available items of historical interest from their collections.